Following last year’s inflation-adjusted OSHA penalties, now is a better time than ever to read our top five workplace safety tips for 2017. Take a look, make a note, do with it as you please; and if you’d like more, just ask us at ASSE 2017, booth #633. Surely you’ve seen those viral videos of rack collapsing to the ground, leaving a cloud of dust and damaged inventory and equipment in its wake. That loud crashing of inventory and material is a distinct sound that translates to costly damages, delayed operations, and injured personnel. Overloading and rack structure quality is often the first to blame when videos like these afloat; however, even the highest quality rack is susceptible to that one final ‘bump’ from a forklift. It is only in hindsight of these incidents when many facility owners realize they should have invested in greater protection for their structures. Guarding rack with strong, protective steel barriers is a minimal investment that can save you thousands of dollars in damaged material, down time, and injuries down the road. Rack protectors are designed to guard both end-of-aisle and inline rack uprights, and are available in different levels of strength based on your facility requirements. Don’t let your facility surveillance tape be the next to go viral; a simple purchase of quality steel rack protectors will improve the safety of your rack areas for years to come. Many plants use orange or yellow tape on their floors to designate forklift lanes or safe areas for employees and equipment. But what happens if a forklift misses a turn and veers into one of those safe areas? Is the tape going to stop it? This scenario is actually quite common, as each year there are about 80 fatal forklift accidents in the United States, with 34,900 more accidents that result in serious injury, according to the Occupational Safety and Health Administration (OSHA). Of the 80 fatalities, about half occur in manufacturing facilities. Obviously, a strip of highly visible tape on the floor isn’t going to stop a forklift, but what will stop it is industrial steel guard rail. With vehicles coming and going, and docks that can be several feet from the ground, loading stations are busy places filled with potential dangers. It doesn’t take much for someone to lose their bearings and accidentally step off an unsecured dock and fall to the ground, leaving them injured and the company with a costly workman’s compensation claim. 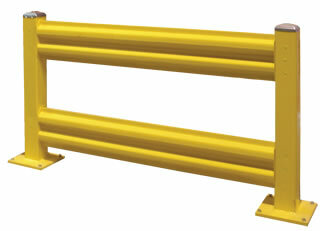 To alleviate this hazard, safety gates can be installed to provide a secure barrier when the dock is not in use. A well-designed gate is one that can be easily opened and closed by just one person, and meets the 200 pound force protection requirement outlined by OSHA. Several styles of dock gates are available to accommodate a variety of loading docks. With forklifts and other vehicles constantly backing out of trucks on loading docks, a driver’s vision may be blind to certain areas while in transit. 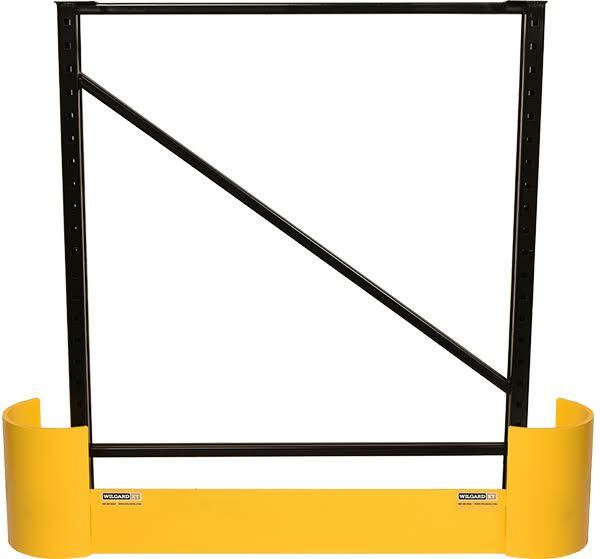 Consider installing guard rail on your loading docks to identify designated travel paths and prevent forklifts from inadvertently striking a worker or storage racks. Use a rolling ladder stand. What’s the best way to perform maintenance just out of reach? It may be quicker and more convenient to climb on top of a nearby object or use a conventional ladder, but those are not good options for many reasons. For starters, performing work on special machinery could be potentially dangerous if the object you are standing on does not provide an optimal level of balance and support. A shift in body weight, or overreaching, could be all it takes to lose balance while standing on these objects during work. Second, a conventional ladder or an impromptu stool could make for a difficult time when performing maintenance on machinery, as they don’t provide an actual work station. For maintenance projects that last hours at times, having to constantly climb up and down a conventional ladder risks higher potential to slip, and creates fatigue. Last, because these objects do not provide much support, you (or your tools/equipment) may often end up leaning on your expensive machinery. This unnecessary contact with the machinery could result in potential scratches, damage, or other harm to both you or your expensive investment. The smarter choice is to use a rolling ladder. Rolling ladders, such as a Rolastair™, are available in standard and custom designs that can meet your application requirements. Using a rolling access ladder with the proper height and construction allows you to obtain access to products or work areas in a safe and efficient manner. They lock in place during use, providing a secure platform, greatly reducing the risk of falling while also minimizing injuries associated with reaching. 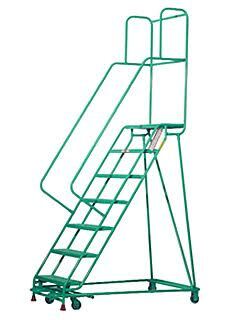 Rolling ladders are fairly inexpensive, and go a long way toward improving the level of safety for employees. Moving materials from one level to another? The traditional way has been to use a forklift, but anytime a moving vehicle is involved, the chance of an accident is present. A safer alternative could be to use a vertical reciprocating conveyor (VRC). 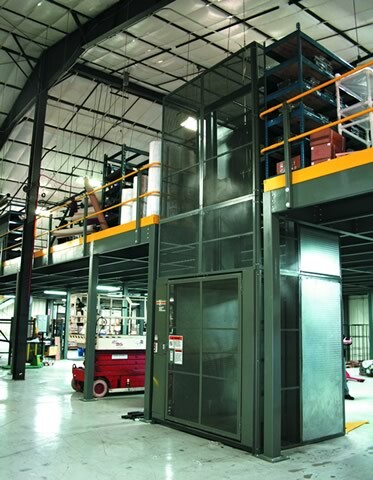 VRCs act much like an elevator as materials are loaded onto an enclosed platform, secured, then transported to an elevated level. VRCs are capable of moving materials of all sizes, and can even be integrated into existing material handling/automated systems. VRCs are a safer alternative in moving materials in comparison to forklifts. That’s because you’re removing the human element from the forklift. You could have a very safety conscious person driving the forklift, but there’s still a chance of the vehicle striking something or someone. With a VRC, the forklift is removed completely from the equation, eliminating the chance of a vehicle accident. All companies can make improvements toward creating an environment as safe as possible for their employees. The best way to get started is to perform a safety audit of your facility. A reputable material handling supplier can assist you in identifying areas that could benefit from a safety upgrade. By fostering a greater culture of safety, companies will keep their most valued resource productive and out of harm’s way for years to come. Cory Thomas is the Guarding Products Sales Manager at Wildeck, Inc. He can be reached at 800-325-6939 or cthomas@wildeck.com.